Now I've worked out that there are two types of Lush shoppers: the ones that always pop in to get the odd bath bomb every time (or most times, at least) they walk by, and then there's the people that hardly go in, but when they do they end up going overboard and buying a just-about-justifiable amount at once. As for myself? I'm probably the latter (uh-oh), but I had to restrict myself when I was mooching in Southampton last week, because I had a £10 note to work with, and I'm pretty pleased with what I chose. So I got the 'Big Blue' bath bomb, which isn't pictured here and you can probably guess why (yes, I've already used it). It's got seaweed in it, so it makes your skin soft and lovely and oooo. One problem though, is that the seaweed is a nightmare to get rid of when you're finished. It's the same problem as the glittery bath bombs, there's a nightmare when it comes to cleaning your bath afterwards. But, it smelt amazing, and made my bath a totally cool shade of blue, so I think that it's worth the hassle. 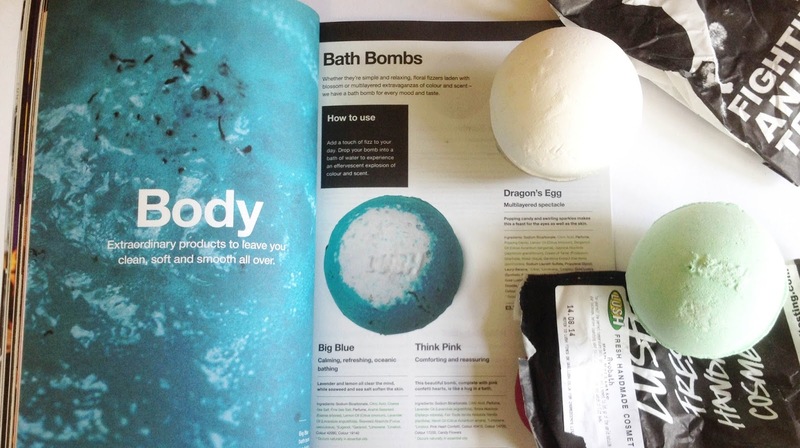 I then picked up the 'Dragon's Egg' bath bomb, and I've had this one before so I can tell you how amazing it is. I adore the scent, and the little circular pieces that float about in the bath, but as far as Lush bath bombs go, this is one of the more simpler ones. There's no colour-changing bath water, just a great smell and it's one of my favourites for just a nice, refreshing and relaxing bath. This last bath bomb is much greener that it's made out on this picture, and it's the one that I'm most excited to try. It's the 'Avobath', and as the name suggests, it's main ingredient is avocado. This was by far my favourite smelling bath bomb, quite possibly my all-time favourite smell (big achievement for the Avobath right there), and I'm so excited to try it. I'm not sure if it will turn my bath very green, but maybe more of a pastel green shade, and I don't mind as long as it smells as amazing as it does pre-bath time.